Missouri features an impressive landscape of thriving wetlands, colorful prairies, winding rivers, and more than 1,000 caves. From its lush, sheltering forests to its cool, clear streams, Mark Twain’s home state is a place that encourages peaceful contemplation. Missouri’s natural surroundings impart a tranquility that is impossible to leave behind. 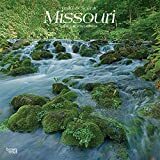 Enjoy the serenity of wild and scenic Missouri in this square wall calendar.